Bombshell pencil skirt to hug those curves! Imported from England, Collectif brings us this thick, 98% cotton and 2% spandex drill cotton, similar in weight and feel to a Summer denim. It is tight and tailored but with plenty of movement and stretch for maximum comfort and a perfect fit. 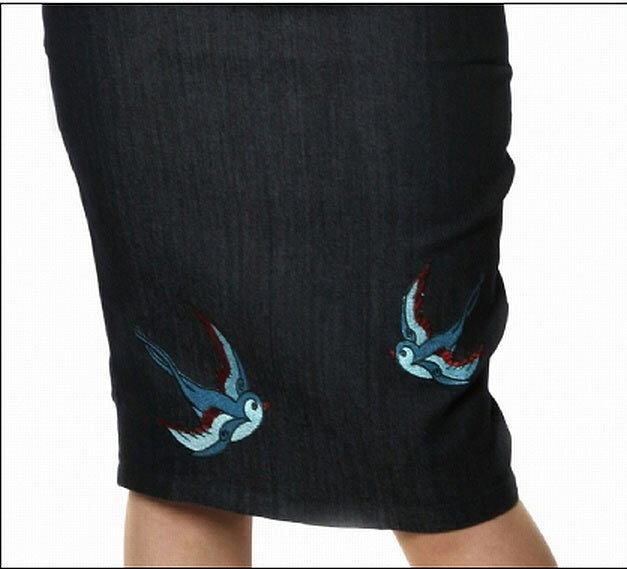 It features two blue and red swooping swallows on the hem of the skirt. 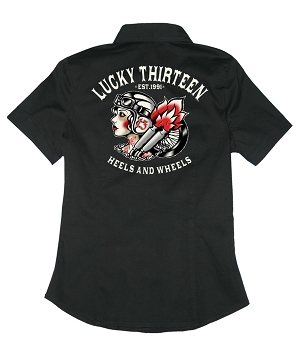 The images are embroidered into the cloth, not printed or iron-on patches so they will not peel, fade or crack. The skirt has three panels; two at the front and three at the back with darts at the waist to create a perfectly tailored fit that hugs your curves in all of the right places. The body has a hidden zip in the rear seam and a classic split up the center seam, at the back of the skirt. The split is approximately 9"in length.